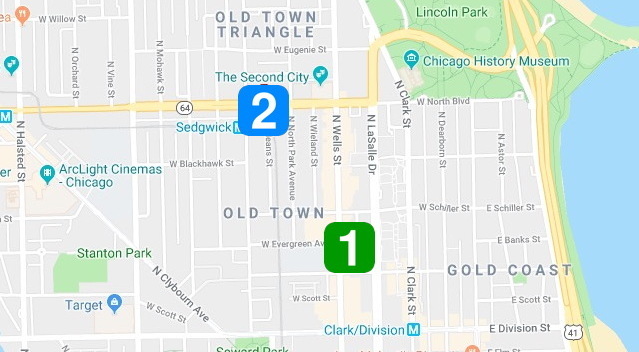 Approximate locations of robberies reported Wednesday evening in Old Town. Two robberies were reported in the Old Town neighborhood between 7 and 7:30 Wednesday evening, police said. No one is in custody. Just after 7 o'clock, a 40-year-old woman was walking in the 1300 block of North Wells when two men approached her from behind, struck her, and took her valuables, according to a police spokesman. The offenders then ran from the scene. Police said the suspects are two black males between 17- and 20-years-old who were wearing dark shirts and jeans. They were last seen heading westbound from Wells Street. Then, around 7:25 p.m., a 26-year-old woman was mugged by two offenders who displayed a handgun and took her Apple Watch in the 1500 block of North Orleans, according to a police report. Police said the offenders were two black men between 17- and 20-years-old who are thin and about 6-feet tall. One wore an olive-colored hoodie and the other wore a black zip-up hoodie. A witness said the men fled eastbound and got into a dark sedan, possibly an older four-door Pontiac, according to police.